Today I want to share a healthier twist on a classic zucchini bread, which is gluten free, grain free, and paleo friendly. Introducing Zucchini Bread with Sweet Cashew Cream Cheese, high in fiber, and protein sans dense or refined carbohydrates. I don’t know about you, but I naturally gravitate towards warm, comforting, carbohydrate-rich foods in the fall and winter seasons. Therein lies a problem, typically most of us get a little carried away eating too many carbohydrates than our bodies need (especially if you’re not active!) and with the fall and winter holiday treats approaching us, this is a time to be even more mindful. So let’s enjoy and feel guilt-free about this bread indulgence! I remember as a little me, my mother making fresh zucchini bread towards the end of the summer due to our overgrowth of zucchini in the garden. It was one of those smells and experiences that always floods my mind in the late summer early fall when the smell in the air changes and the crisp mornings ensue. 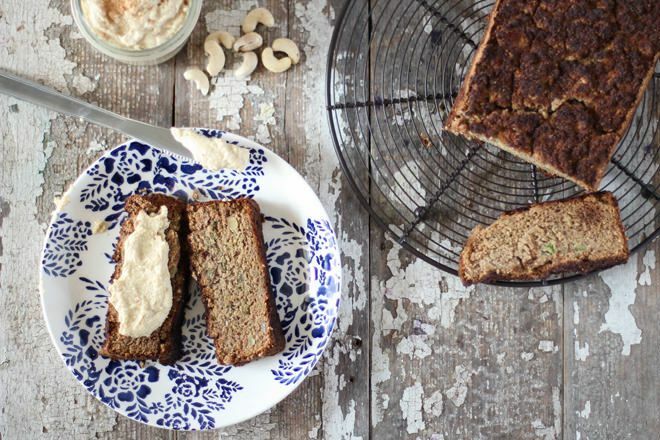 This is the time of year I crave warm and delicious banana or zucchini breads just like she used to make (and still does!). Several months ago I introduced the Grain-free Banana Bread with Cinnamon Cashew Cheese Spread as an homage to my mothers recipe, now it’s the zucchinis turn! A classic way to serve banana or zucchini breads is to top them with a rich and sweet cream cheese or some type of sweet fluffy topping, which is a perfect flavor and texture combination with the spongey zucchini bread. Naturally, when I was thinking of remaking this recipe with a dairy-free twist for me, I thought of how I can keep the integrity of this classic experience and still meet my dietary preferences (gluten free and dairy free). Now of course, if dairy works for you feel free to use a real cream cheese, but give this Sweet Cashew Cream Cheese a try first- it won’t disappoint! A high protein, lower carbohydrate grain-free (paleo friendly) take on the classic zucchini bread, topped with cashew cream cheese! Grease (with coconut oil/butter) a bread loaf pan (or you could use muffin tin for muffins). Shred the zucchini with a grater or food processor with the shred blade (you will want 1 cup of this total). With the remaining zucchini, puree in a blender. Combine all the wet ingredients (vanilla, eggs, coconut oil/butter, zucchini) into a bowl with a hand mixer (or of course your trusty Vitamix). Combine all dry ingredients into a large mixing bowl (coconut flour, almond flour, baking soda and powder, salt, cinnamon). Pour the mixed wet ingredients into the large bowl of dry ingredients. Mix well with a wooden spoon until the batter has come together. Pour the dough into your lightly greased pan. Bake at 350 for 45-60 minutes (depending on your oven settings, mine took about 45min.). Check after 30 minutes. Note all oven settings are different, and this bread may require longer baking times than others. Let set and cool (this is the hard part!). Slice and serve with a spread of Sweet Cashew Cream Cheese, coconut oil, grass-fed butter, peanut butter, almond butter, jam… the possibilities are endless! This is a very delicate bread, be careful when taking it out of the bread pan and allowing it to cool completely before cutting. [br]Store in the fridge after eating. The Grain-free Banana Bread was served with Cinnamon Cashew Butter, recently I shared with you the Classic Cashew Cheese used for more savory dishes, and now below is the sweet version I use as a basic cream cheese. This Sweet Cashew Cream Cheese can be used with any sweet dish, dipping fruit, spreading on toast with cinnamon, dolloped on a Simply Oat Pancake, etc. A non-dairy sweet, thick, and creamy cashew cream cheese to be used like classic cream cheeses. Soak cashews for at least 2 hours or until softened. Simply blend all the ingredients in a Vitamix or high speed blender/food processor until thick and creamy. What’s your favorite topping on Zucchini bread? Do you have many zucchinis left from the summer season? Slice and serve with a spread of Sweet Cashew Cream Cheese, coconut oil, grass-fed butter, peanut butter, almond butter, jamâ¦ the possibilities are endless!